Sharks Cove is the best place to snorkel hands down. 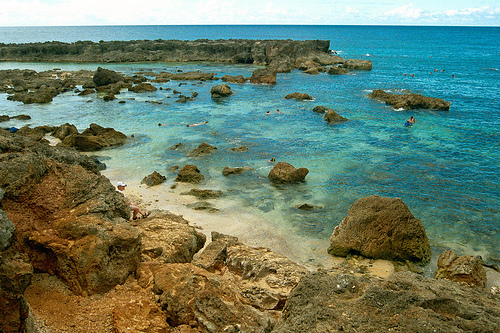 Your kids can play in the tide pools they are only a few feet deep and the water is more clear than Hanauma bay. This is my kids favorite beach and they are 8,6,4 and 2. The picture below is Sharks Cove in the winter time. 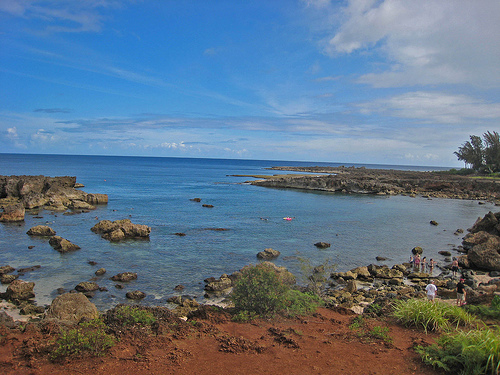 Sharks Cove is a wonderful reef on the North Shore where a large variety of marine life can be seen in their natural environment. The reef can only be accessed during calm seas. During the Winter, the reef cannot even be seen due to the large waves. As the name implies, some white-tipped reef sharks call this cove home. Sharks are generally not aggressive so DO NOT approach or molest them. Turtles are often seen in this cove. This is a wonderful beach for swimming, snorkeling, and scuba diving during the months of March through October when the seas are calm. There are no lifeguards. Wear shoes due to the sharp coral and rock formations. The Ocean drops off to about 25 feet at the end of the reef. 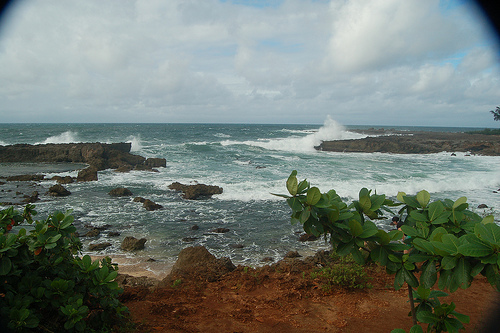 Sharks Cove OCEAN INFORMATION — For a detailed description of the Pacific Ocean’s marine climate, water properties, currents, tides, waves, etc., please visit The Ocean Atlas of Hawaii online. You’ll learn many interesting facts, like our average surface water temperature in Winter is 75 F (24 C) and 81 F (27 C)in the Summer.Call 596-SURF (that’s 596-7873) to hear a recorded message on conditions at various O`ahu beaches. The recording is a free service of the Surf News Network (SNN) and is updated four times a day, 365 days a year, at 7 a.m., noon, 3 p.m. and 7 p.m. In addition to wave heights, SNN provides information on winds, tides, and buoy readings.